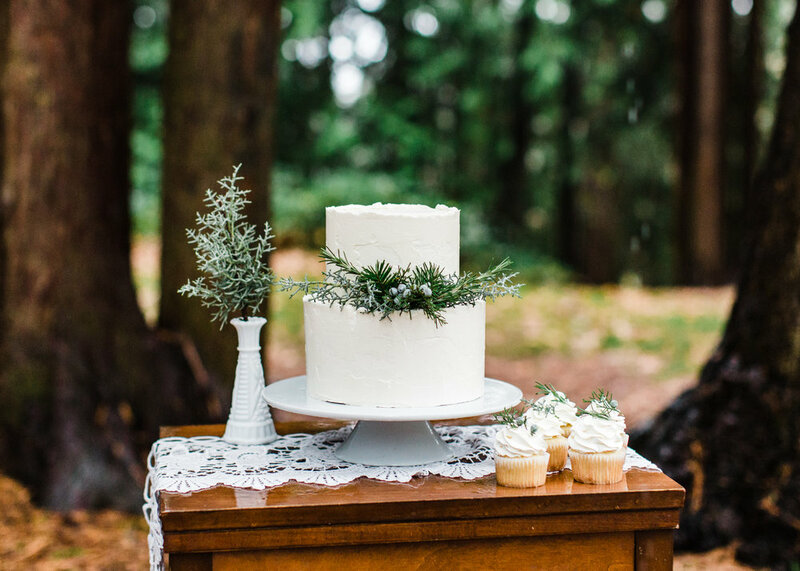 Evergreen: Styled Shoot — South Fork Cake Co. 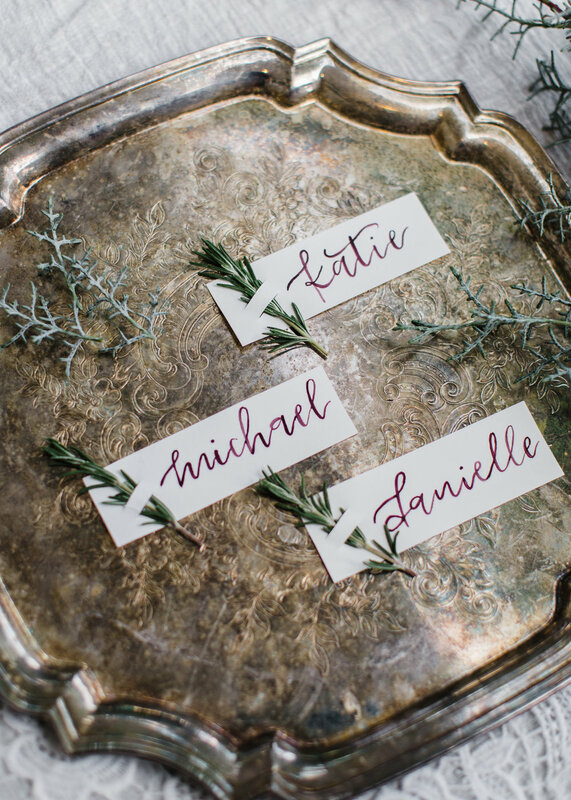 It doesn't get much more beautiful than deep evergreen playing off of rich wine-burgundy does it? Now, before I start gushing about how gorgeous this shoot was, I want to first shout out our amazing models, Anita and Dylon, who literally stood in the freezing cold rain for HOURS to help bring this shoot to life. Looking at these pictures, you almost can't tell they were soaked to their bones, which is incredible. Anita looked absolutely stunning in her dress and Dylon helped Alex and I with all of the behind the scenes work without a single hesitation. Friends are cool, aren't they? 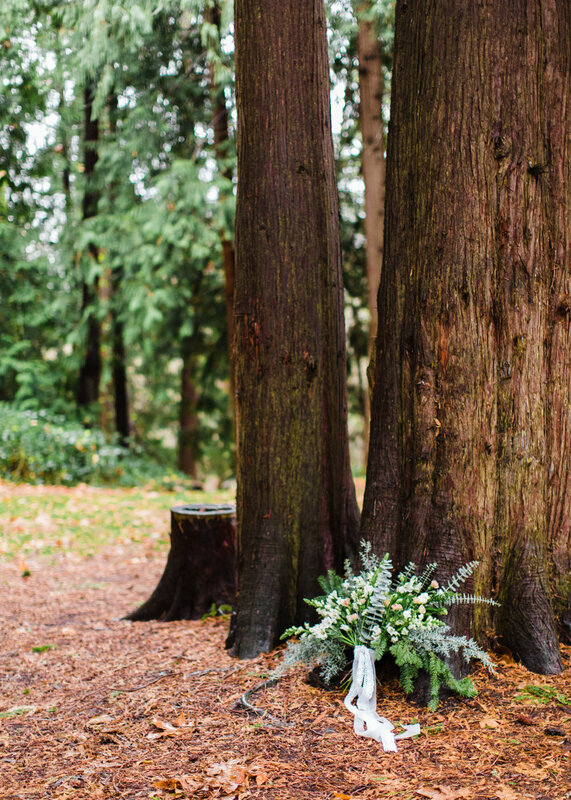 For the original concept of this shoot, I 100% pictured it set on a sprawling tree farm with wide, grassy aisles. I even scouted tree farms. Scouted! 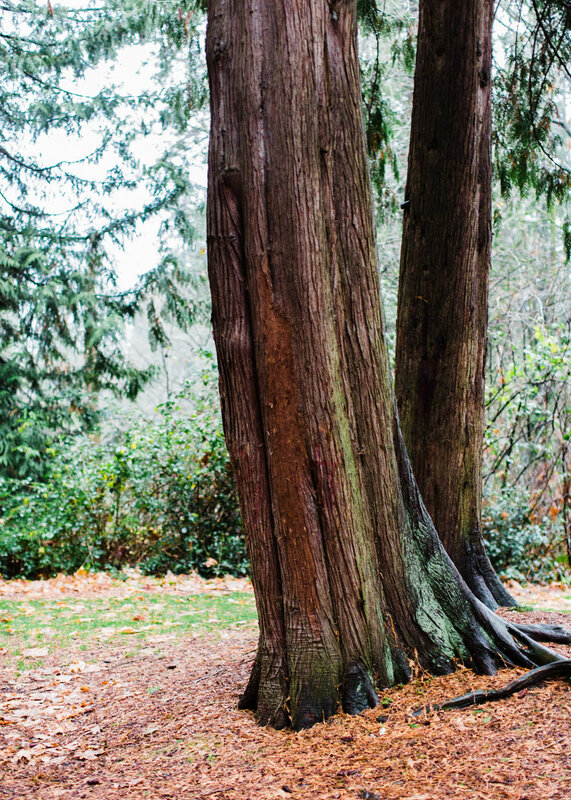 But, when the day of the shoot arrived and the rain was pouring down, I knew we would need to go somewhere the trees could provide a bit of cover, and honestly, where we ended up is way better than a tree farm you guys. 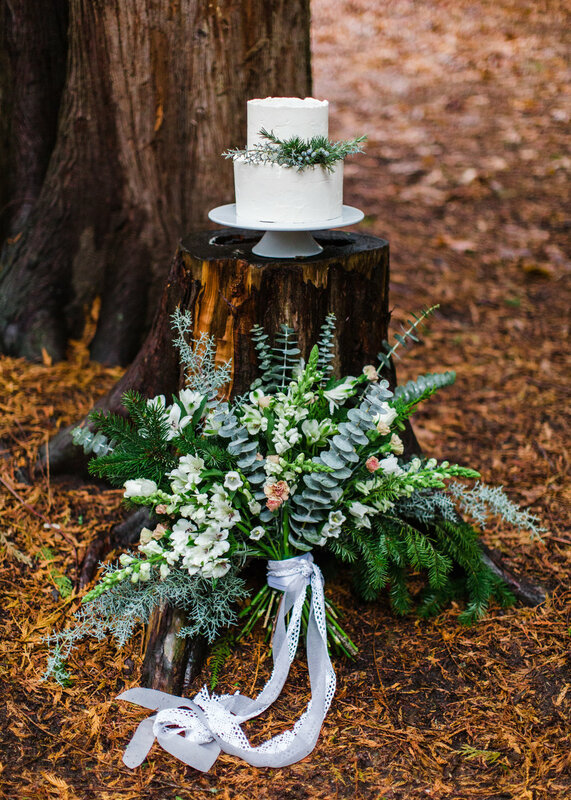 The tall stand of cedars we nestled ourselves in was the perfect backdrop for this shoot. When I first pitched this idea to Alex, our badass photographer, I basically just said "evergreen vibes... with burgundy" and that's all she needed to help me run with the inspiration. 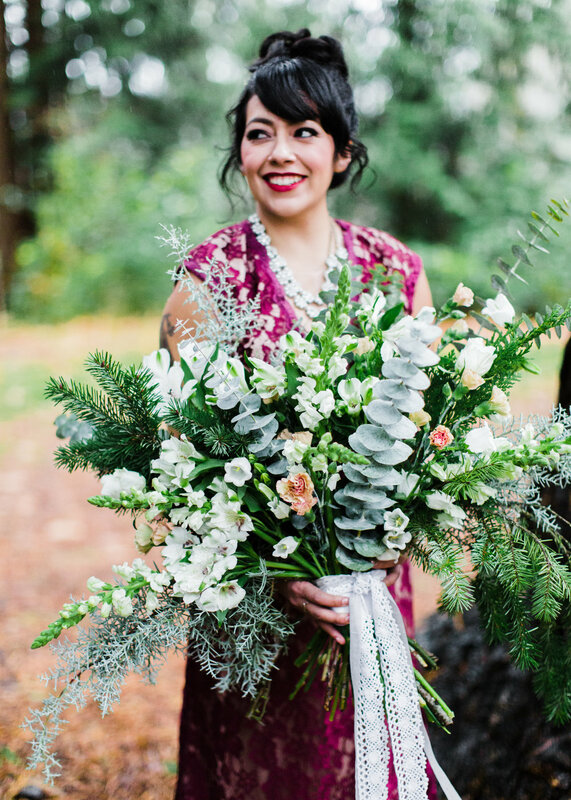 She helped coordinate the hair and makeup with our fave, Shyn, of Pacific Brides who killed it as usual. 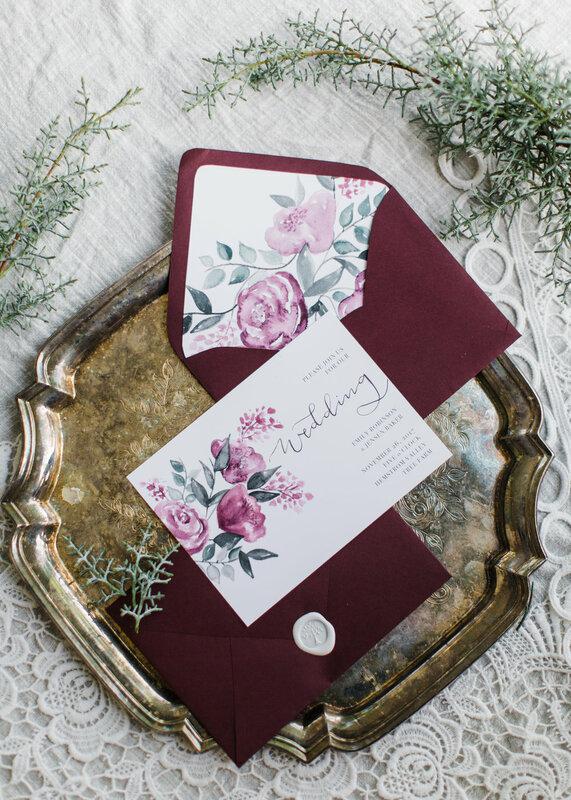 I also reached out to the super talented Whitney of W. Design Shop to create our stationery suite. With almost no notice at all, she produced the most stunning and fitting paper suit I ever could have asked for! She somehow knew exactly what to do with my super vague (and probably poorly worded) description of the shoot. She got the color exactly right. Amazing. It would be insane not to point out that Alex also created the extraordinary bouquet for this shoot. She has been gaining a serious interest in florals and I was so excited she got to flex her creativity in such a beautiful way. I had heart eyes all day staring at that beauty. It's such a crazy, beautiful thing when you can have a little piece of an idea in your brain and the people you work with just make the whole puzzle come together! 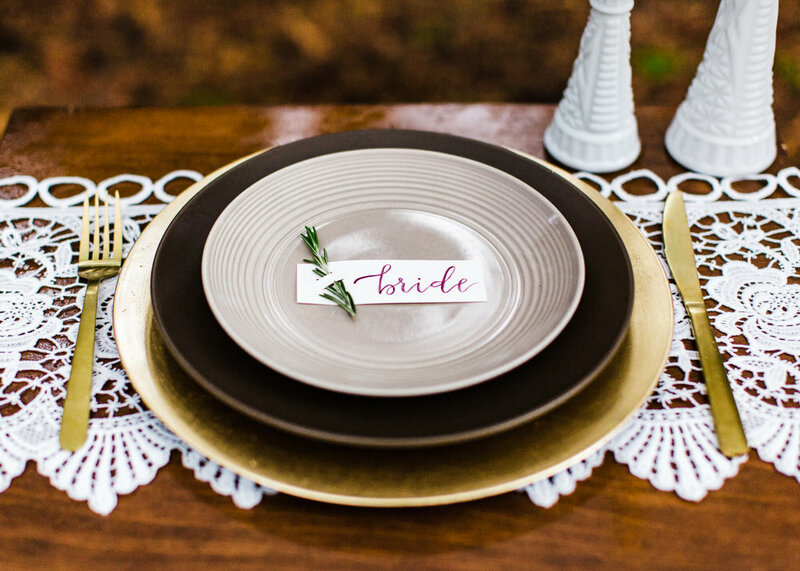 I am constantly inspired by the talented vendors in this industry. 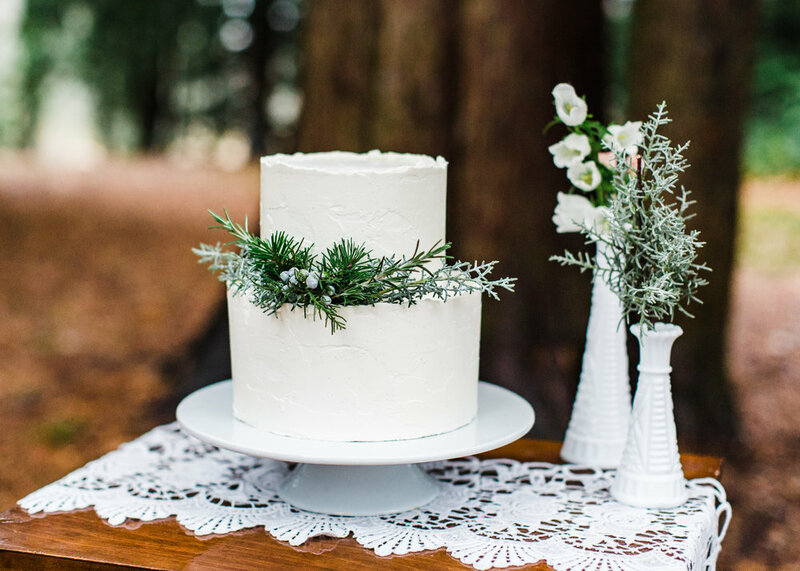 For my contribution, I wanted to make desserts that felt 'designed' but which also had a laid-back Pacific Northwest feeling that's super hard to describe but you know it when you see it. 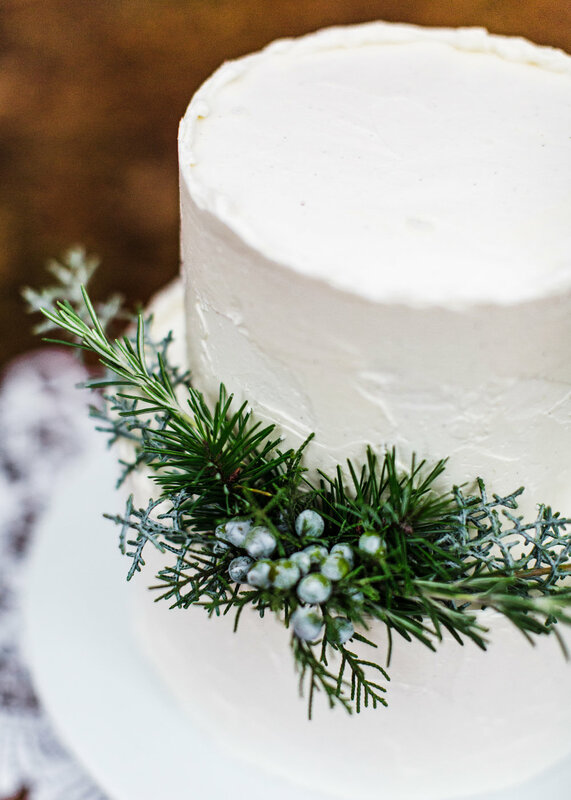 The cake is an almost-smooth stucco texture with a raw edge (a.k.a. 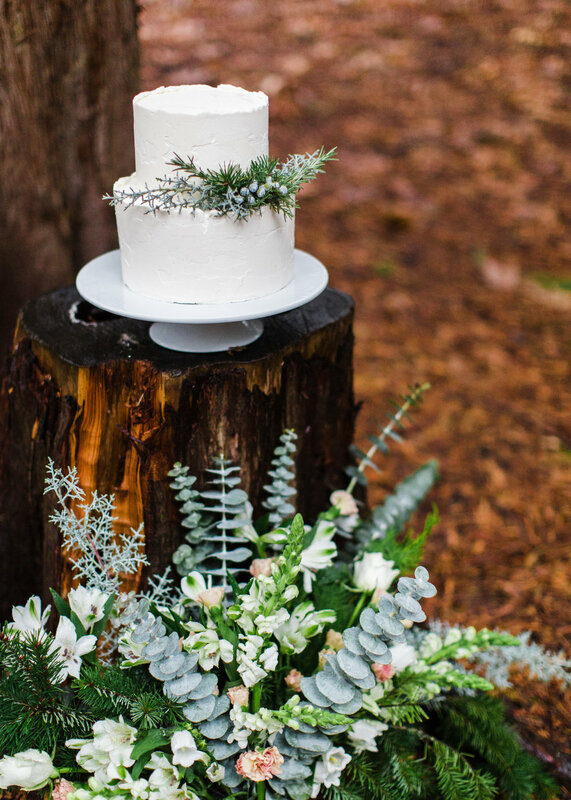 my current favorite thing) accented with a spray made up of a variety of greens and the cupcakes are hi-top swirls with little sprigs of evergreen-ery on top to pull the look together. 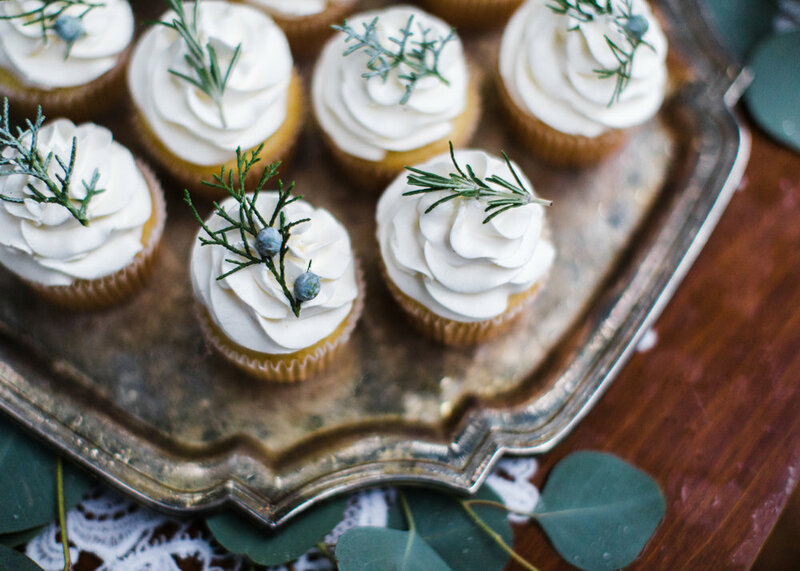 I got to use rosemary from my dad's garden on both the cake and cupcakes and it just makes me so incredibly happy!